Today I wore a summery skirt, just because I felt like it. Pair it with some thick leggings and voila! 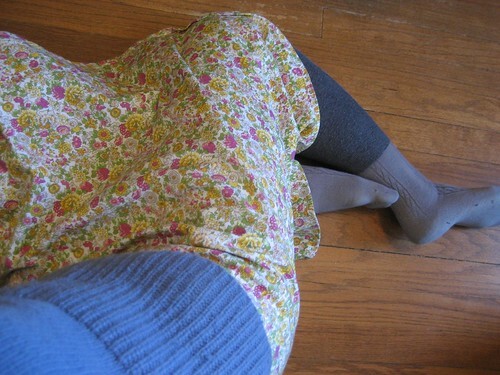 Summer skirt turned winter skirt. I want to get wool tights, though. That would be so nice. Look! The kitties want a peek! Got this magazine a couple of weeks ago, but haven't had a chance to look at it a lot. There are two skirts in there that I want to make up for the winter. I am thinking wool and corduroy. Yesterday I picked up a corduroy skirt and a bias plaid Christmasy looking skirt at Salvation Army. All together it was something under $5. That felt good. They need washed, though. And I might change the lining in the cord skirt. I love winter clothes and bundling up. 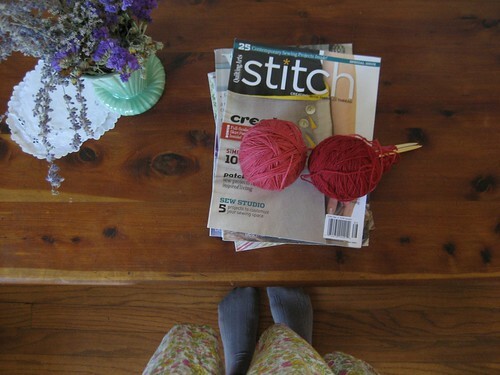 I'm still knitting up a storm, but have decided I'm a very loose knitter. I think I need to use needles two sizes smaller than the patterns recommend. Luckily, the garment I am knitting right now will look nice in the looser knit, so it should be fine. aw your kitties are adorable! i love their coats. Lovely! My winter wardrobe is my summer wardrobe, plus thick tights, long sleeved shirts underneath everything, and cozy sweaters on top. I never understand people who pack clothing away for the season. I am just beginning to learn how to layer things up for really cold weather....something I never learned how to do in Florida! ;) tee hee! 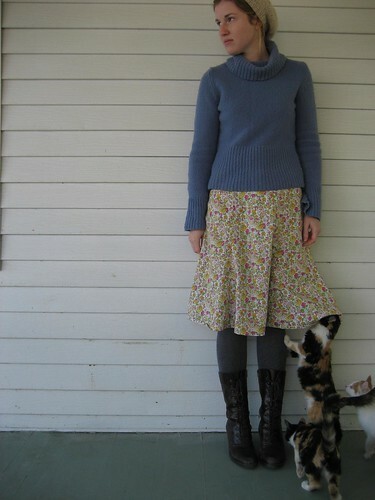 I love your floral skirt with the winter woolies! So pretty! I think the 'idea' of wool tights is wonderful and cozy....but am rather allergic! I'm sure they would be nice and warm, though! I've been wanting to make up a pair of flannel lined dungarees for winter....in a very 50's style! Winter clothes are definitely the best!